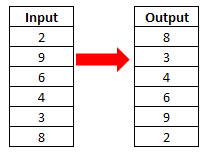 This tutorial explains how to reverse order of data in SAS. The POINT= option allows us to point to and select a given observation. The NOBS= creates and names a temporary variable whose value is usually the total number of observations in the input data set or data sets. If more than one data set is listed in the SET statement, NOBS= the total number of observations in the data sets that are listed. 5 Responses to "SAS : Reverse Order of Data"
Why did we use stop? Because Point uses Direct Access Read Mode while reading input data set and hence it does not understand EOF marker which specifies end of file. If you do not specify STOP statement then the above program will go in infinite loop. To avoid that we use stop statement to explicitly specify end of input file. Can u explain more examples on this.